(A) Structure of the 3 loci (adjacent to the ITIH4, IGF2R, and VTN genes) used as hepatocyte biomarkers. Lollipops represent CpG sites. Red indicates CpG sites represented in the Infinium HumanMethylation450K BeadChip. Arrows mark positions of PCR primers. Markers are defined by the methylation status of CpG sites between primers. 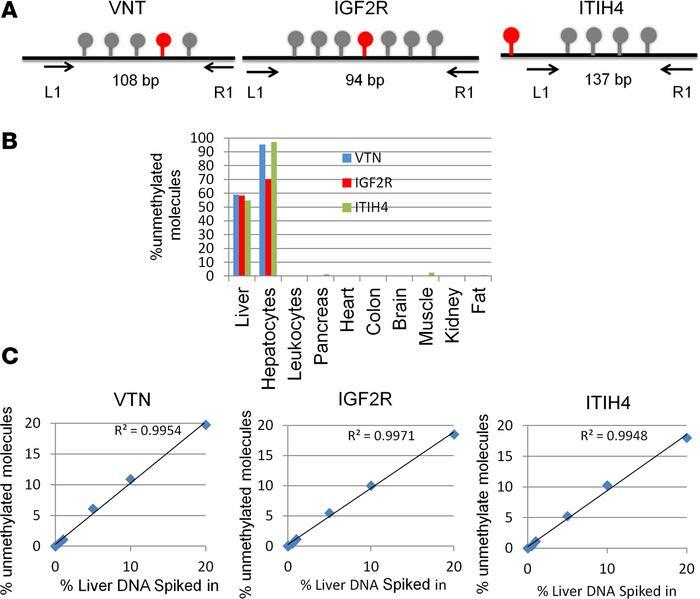 (B) Methylation status of ITIH4, IGF2R, and VTN in DNA from multiple tissues. Shown is the percentage of molecules in which all CpG sites were unmethylated. (C) Spike-in experiments. Human liver DNA was mixed with human leukocyte DNA in the indicated proportions (0 to 20%), and the percentage of fully unmethylated hepatocyte markers was determined.